How’s that austerity thing working out for you (again)? There is simply no denying anymore that Europe is entering the second dip of a double dip recession as a result of it’s austerian policies. Gross domestic product in the euro zone fell 0.1 percent in the three months through September compared with the previous quarter, according to Eurostat, the European Union statistics agency. The downturn was slightly less severe than in the second quarter, when growth contracted 0.2 percent. But it was the fourth quarter in a row of zero growth or worse. Perhaps more worrisome, the data showed that Spain, Portugal and several other countries remain far from the kind of recovery that would bring increased tax receipts and help them overcome their debt problems. European leaders, who have benefited from a tenuous calm on financial markets in recent months, are likely to face additional pressure to ease the government austerity programs that have undercut growth in Southern Europe. A recession is often defined as two quarters in a row of falling output, though many economists say it is important to take other data into account. But with unemployment in the euro area at 11.6 percent and nearly 26 million people out of work, few would dispute that the region is in a deep downturn. “Leading indicators suggest that the euro zone recession will broaden and deepen in the current fourth quarter,” said Martin van Vliet, an economist at ING Bank. (I)n Western Europe the economic decline spread to Austria and the Netherlands, which had been growing in previous quarters. The Austrian economy contracted 0.1 percent, while the previously healthy Dutch economy plunged 1.1 percent, catching economists off guard. One reason for the decline was that Dutch consumers cut back purchases of cars, illustrating how the crisis in the European auto industry is having a broader effect. Slower export growth and a decline in construction also had an effect, according to Statistics Netherlands, the official data provider. Europe’s economic malaise is deepening as governments across the region impose budget cuts to narrow their fiscal deficits. Spain and Cyprus this year joined the list of countries seeking external aid, following Greece, Portugal and Ireland. Unions across the region have held protests against austerity measures. Euro-area industrial production dropped 2.5 percent in September from the previous month, the most in more than three years, led by double-digit declines in Portugal and Ireland. German investor confidence unexpectedly declined in November, the ZEW Center for European Economic Research in Mannheim said on Nov. 13. Siemens AG, the biggest engineering company in Europe, on Nov. 8 unveiled a 6 billion-euro savings plan to restore profitability, acknowledging it was slow to react to shrinking demand. Commerzbank AG, which is forgoing its dividend, on Nov. 8 reported profit that missed analysts’ expectations on losses from non-core assets and a decline in consumer banking earnings. How about England and our Neo-Liberal friend David Cameron? The UK economy risks suffering from a triple-dip recession amid a period of persistently low growth that will last until the next election, the governor of the Bank of England has warned. Sir Mervyn King cut Britain’s growth forecast to 1% next year and warned that output was more likely than not to remain below pre-crisis levels over the next three years. “There seems a greater risk that the UK economy may be in a period of persistent low growth,” he said on Wednesday. The UK economy emerged from a double-dip recession in the third quarter of this year, when the economy grew by 1%, but King warned that this was driven by one-off factors. “Continuing the recent zig-zag pattern, output growth is likely to fall back sharply in the fourth quarter as the boost from the Olympics in the summer is reversed – indeed output may shrink a little this quarter,” he said. If that period of contraction continues into 2013, the UK could drop into a triple-dip recession. How are people reacting? As you would expect there are massive protests all across Europe. Hundreds of thousands of Europeans mounted one of the biggest coordinated anti-austerity protests across the continent on Wednesday, marching against German-orchestrated cuts as the eurozone is poised to move back into recession. Millions took part in Europe-wide strikes, and in city after city along the continent’s debt-encrusted Mediterranean rim, thousands marched and scores were arrested after clashes with police. There were banners declaring “Austerity kills,” Occupy masks, flares, improvised loudspeakers and cancelled flights. But there was also a violent, even desperate edge to the demonstrations, particularly in Madrid and several Italian cities. In the Spanish capital, police fired rubber bullets to subdue the crowd; in Pisa, protesters occupied the Leaning Tower, and in Sicily cars were burned. The breadth of the demonstrations, which affected scores of cities, reflected widespread unhappiness with high unemployment, slowing growth and worsening economic prospects in Europe, and the resistance that European governments confront as they push plans for more belt tightening. Occasional clashes with the police were reported in some cities. Among those striking on Wednesday were railroad workers in Belgium; airline workers, autoworkers and teachers in Spain; civil servants in Italy; and transit workers in Portugal. Union leaders called the coordinated actions historic. The tumbrils are closer than you think. Over the last day or so it has been widely rumored that British Petroleum has reached a settlement on criminal charges for the 2010 Deepwater Horizon Disaster in which at least 11 people lost their lives on the rig alone and spilled over 4.5 Million Barrels of Oil and uncounted amounts of toxic chemicals into the Gulf of Mexico. Even with a settlement on the criminal claims, BP would still be subject to other claims, including federal civil claims and claims for damages to natural resources. In particular, this settlement does not include what is potentially the largest penalty: fines under the Clean Water Act. The potential fine for the spill under the Clean Water Act is $1,100 to $4,300 per barrel spilled. That means the fine could be as much as $21 billion, according to Peter Hutton of RBC Capital Markets in London. Sources say at least 2 employees will be charged with manslaughter. NEW YORK (CNNMoney) — BP announced Thursday it settled criminal charges with the U.S. government over the 2010 Deepwater Horizon oil spill for $4.5 billion. But that won’t resolve some of the biggest liabilities still facing the company. BP’s $7.8 Billion settlement with victims in the uncapped class action has yet to be approved by courts. Ray Lehmann, co-founder of the R Street Institute, a mouthpiece for the insurance lobby (formerly a division of the climate-denying Heartland Institute), had another public prize in his sights. In a Wall Street Journal article about Sandy, he was quoted arguing for the eventual “full privatization” of the National Flood Insurance Program, the federal initiative that provides affordable protection from some natural disasters-and which private insurers see as unfair competition. Ms. Klein is speaking on Friday night at the Hammerstein Ballroom in New York City as part of 350.org’s “Do the Math” tour with Bill McKibben. Thom Hartmann: It’s the “Jobs Cliff,” Stupid! In other words, the “fiscal cliff” is another classic example of what Naomi Klein called “Disaster Capitalism.” Create a panic, and then profit from it. For example, Wall Street is helping fund groups like the Third Way that are pushing hard for us to give our Social Security Trust Fund – which has over two and a half trillion dollars in it – to Goldman Sachs and Citibank so they can take care of it for us. Doesn’t that make you feel all safe, and warm-and-fuzzy? Jeremy Scahill: The Petraeus Legacy: A Paramilitary CIA? It was the CIA director’s relationship with JSOC-not Paula Broadwell-that should have raised concerns. Congress is still talking about a “Grand Bargain” that “balances” far more spending cuts than tax increases. That is another way of saying that you – the consumer of Medicare and Medicaid services, the recipient of Social Security, and the average taxpayer-will take the brunt of the spending cuts, while the wealthy get their income taxes restored, not raised, to their pre-Bush modest levels. Don’t buy it! There are two ways to cut Medicare and Medicaid. The right wingers want to cut benefits. Consumers want to cut vendor fraud, the overcharging and the immense over-diagnosis, over-treatment and erroneous or unnecessary procedures and prescriptions documented so often by, among others, the Dartmouth Institute for Health Policy and Clinical Practice (http://tdi.dartmouth.edu/), Johns Hopkins University School of Medicine and the Harvard School of Public Health. 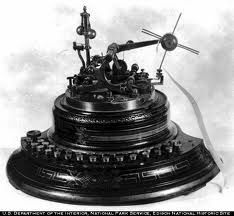 On this day in 1867, On this day in 1867, the first stock ticker is unveiled in New York City. The advent of the ticker ultimately revolutionized the stock market by making up-to-the-minute prices available to investors around the country. Prior to this development, information from the New York Stock Exchange, which has been around since 1792, traveled by mail or messenger. Stock tickers in various buildings were connected using technology based on the then-recently invented telegraph machines, with the advantage that the output was readable text, instead of the dots and dashes of Morse code. The machines printed a series of ticker symbols (usually shortened forms of a company’s name), followed by brief information about the price of that company’s stock; the thin strip of paper they were printed on was called ticker tape. As with all these terms, the word ticker comes from the distinct tapping (or ticking) noise the machines made while printing. Pulses on the telegraph line made a letter wheel turn step by step until the right letter or symbol was reached and then printed. A typical 32 symbol letter wheel had to turn on average 15 steps until the next letter could be printed resulting in a very slow printing speed of 1 letter per second. In 1883, ticker transmitter keyboards resembled the keyboard of a piano with black keys indicating letters and the white keys indicating numbers and fractions, corresponding to two rotating type wheels in the connected ticker tape printers. Newer and more efficient tickers became available in the 1930s and 1960s but the physical ticker tape phase was quickly coming to a close being followed by the electronic phase. These newer and better tickers still had an approximate 15 to 20 minute delay. Stock ticker machines became obsolete in the 1960s, replaced by computer networks; none have been manufactured for use for decades. However, working reproductions of at least one model are now being manufactured for museums and collectors. It was not until 1996 that a ticker type electronic device was produced that could operate in true real time. Simulated ticker displays, named after the original machines, still exist as part of the display of television news channels and on some World Wide Web pages-see news ticker. One of the most famous displays is the simulated ticker located at One Times Square in New York City. Ticker tapes then and now contain generally the same information. The ticker symbol is a unique set of characters used to identify the company. The shares traded is the volume for the trade being quoted. Price traded refers to the price per share of a particular trade. Change direction is a visual cue showing whether the stock is trading higher or lower than the previous trade, hence the terms downtick and uptick. Change amount refers to the difference in price from the previous day’s closing. These are reflected in the modern style tickers that we see every day. Many today include color to indicate whether a stock is trading higher than the previous day’s (green), lower than previous (red), or has remained unchanged (blue or white). President Obama will open deficit reduction talks on Friday with a call for a $1.6 trillion tax hike on corporations and the wealthiest Americans over the next 10 years. Obama and House Speaker John Boehner are sitting down to avert the so-called “fiscal cliff” of expiring tax cuts and automatic spending reductions set to take effect at the end of the year. We’re joined by Guardian columnist Glenn Greenwald, who says the protection of “entitlement” programs will depend on action from Obama’s progressive supporters. “The question is: Will the Democratic Party, and specifically the progressive and liberal component of the Democratic Party, change its behavior from cheerleader, from blindly supportive, partisan apparatchiks … into some kind of a force where they actually fulfill their duties as citizens, which is to hold political leaders accountable?” Greenwald asks. They don’t call it the “cliff” for nothing. It’s the fiscal spot where a nation’s representatives can gather and cry doom. It’s the place – if Washington is to be believed – where, with a single leap into the Abyss of Sequestration, those representatives can end it all for the rest of us. As a start, relax. Don’t let the headlines get to you. There’s little reason for anyone to lose sleep over the much-hyped fiscal cliff. In fact, if you were choosing an image based on the coming fiscal dust-up, it probably wouldn’t be a cliff but an obstacle course – a series of federal spending cuts and tax increases all scheduled to take effect as 2013 begins. And it’s true that, if all those budget cuts and tax increases were to go into effect at the same time, an already weak recovery would probably sink into a double-dip recession. But ignore the sound and fury. While prophecy is usually a perilous occupation, in this case it’s pretty easy to predict how lawmakers will deal with nearly every challenge on the president’s and Congress’s end-of-year obstacle course. The upshot? The U.S. economy isn’t headed over a cliff any time soon. Among all the spending and tax changes in the queue, and all the hype around the cliff, the great unknown is whether it’s finally farewell to the Bush tax cuts for the wealthy. And that’s no perilous cliff. Letting those high-end tax cuts expire would amount to a blink-and-you-miss-it 0.003% contraction in the U.S. economy, according to Moody’s, and it would raise tens of billions of dollars in desperately-needed tax revenue next year. That’s no small thing when you consider that federal revenue has fallen to its lowest point in more than half a century. Ending these tax cuts for the wealthy would bring in cash to reduce deficits or increase funding for cash-starved priorities like higher education.